Around Christmas and New Year’s Eve, Welsh families might find themselves challenged by a decorated horse (or similar animal) skull waiting for them on their doorstep. Adorned in colorful ribbons and bells, the equine image of death has an especially ghostly appearance thanks to the white sheet draped over the person carrying it. As revelers sing and parade this head-on-a-stick around the neighborhood, doors open to meet the morbid white horse in battle, specifically, a battle of wits through poetry. This is Mari Lwyd, a midwinter, pagan tradition whereby celebrants earn food and drink only after dominating a poetry slam fronted by a skeletal face. Despite often being associated with Christmas, Mari Lwyd is a pre-Christian practice. In fact, some Welsh regions choose to parade their horse skulls through town for other holidays, such as Halloween or May Day. Though the tradition’s exact origins are murky, the image of a white horse has been a powerful symbol in the United Kingdom for at least 3,000 years. The practice also incorporates the centuries-old tradition of wassailing. From Middle English wæs hæil (“be in health”), wassail was originally a sugared-and-spiced drink of mulled ale, curdled cream, roasted apples, and eggs. Those who partook in sharing a huge bowl of this boozy mixture were “wassailing.” The term evolved to describe the custom of begging for booze around Christmas, a time when poor merrymakers expected generosities that would usually be denied. They’d arrive at the doorsteps of wealthier neighbors and ask to drink from the wassailing bowl or have their own bowl filled. Modern Welsh wassailing isn’t class-based, but the end goal remains the same. Wassailers earn an invitation to come in by proving themselves through a back-and-forth rhyming battle with the residents. Once inside, it’s traditional cakes and ale all around. Wæs hæil! 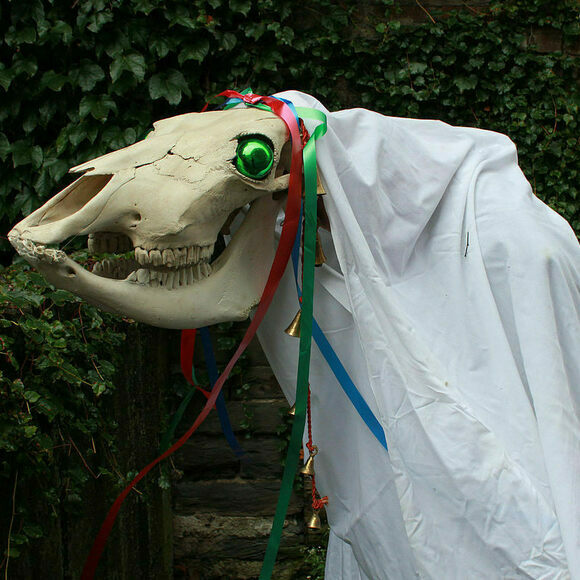 If you can't track down a real horse skull, you can make a paper one using this crafty Mari Lwyd kit. The fire-roasted cheese is the medieval precursor to Welsh rarebit. The seaweed tops toasts and enriches oatcakes in traditional Welsh breakfasts. These holiday cakes link Christmas to the Norse god of lightning.